iOS 4.3 launching on March 10, 2011? Yup. 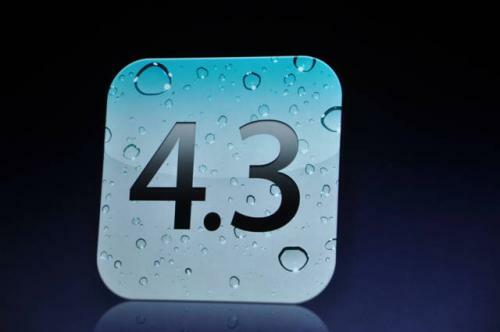 iOS 4.3 will be launching on March 11, 2011 March 10, 2011. iOS 4.3 will launch a day earlier than iPad 2 release date. The rumors have been around the blogosphere these days. 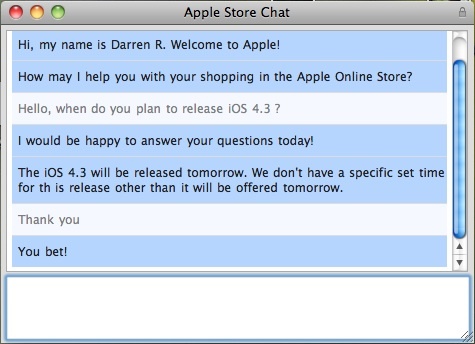 This chat from one of MacRumors.com readers with Apple support suggests that iOS 4.3 might come on March 10, 2011.
iOS 4.3 has been announced in the iPad 2 keynote. iOS 4.3 has a few new features such as better AirPlay, faster Safari browser, iPad side switch (mute or rotate), the Personal Hotspot feature available only in iPhone 4 (That’s sad, what about iPhone 3GS? 🙁 ) and iTunes Home Sharing. – iTunes Home Sharing – allows iOS 4.3 users to play music, movies and TV shows on an iPad, iPhone or iPod touch® from their iTunes library on a Mac® or PC over a local Wi-Fi network. – Enhancements to AirPlay – With iOS 4.3 you can stream additional content including video from third party apps and web sites, videos from the Photos app and previews from the iTunes app to your TV. – Personal Hotspot – This feature in iOS 4.3 lets you bring Wi-Fi with you anywhere you go, by allowing you to share an iPhone 4 cellular data connection with up to five devices in a combination of up to three Wi-Fi, three Bluetooth and one USB device. iOS 4.3 is compatible with iPhone 3GS, iPhone 4 GSM, 3rd Gen iPod Touch, 4th Gen iPod Touch, iPad, and iPad 2. It will be available for download starting on March 11th. or maybe March 1oth? The iPhone 4 CDMA (Verizon) seems to be excluded from the compatibility list. So, standby at the Apple website and let me know if the rumor above is true. Planning to get iPad 2 in Japan this coming March 25th 2011? iPad 2 Price in Malaysia… RM6000++??? Hong Kong, Korea and Singapore iPad 2 Launch Time Confirmed!!! What about Malaysia iPad 2 Launch Date??? Next story iPhone 5 to come with Aluminium Backing & Redesigned Antenna? Previous story I have been invited to YES 4G the Great Penang Food Hunt!! !